Richard Peacock says he’s thankful to be alive after suffering a heart attack while narrowly escaping a fire. 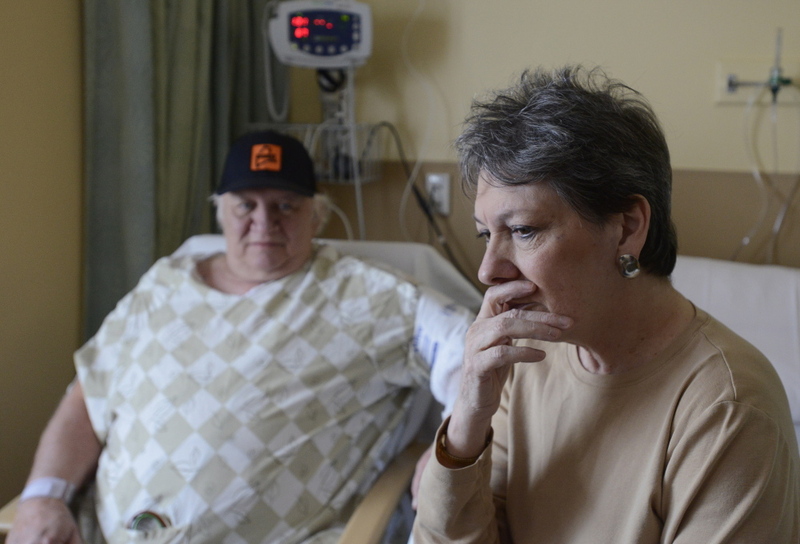 For Richard and Diane Peacock of Freeport, feelings of relief more than offset the holiday bad luck that came their way – twice in one day. Dressed in a hospital gown in the cardiac ward of Maine Medical Center in Portland on Thursday, 65-year-old Richard Peacock said he was thankful to be alive after narrowly escaping a fire that destroyed his mobile home on Christmas Eve. He fled the home barefoot in the freezing cold, leading his dog with a belt and holding his pants up with his other hand while the couple’s home and all of their belongings were consumed by flames. But his troubles weren’t over. “I sat down, and my chest ached,” Peacock said. In the rush from his home, he had suffered a heart attack. Despite the setbacks, Peacock was beaming after doctors told him his heart is in relatively good shape, and that stents that were implanted a decade ago have held up well. He’s thankful that he escaped with his life, and that his wife, Diane, and their dog, Gunner, are safe. “You hear about these stories, and then to be a part of one, it’s a very different perspective,” he said. Peacock was asleep in a hospital-style bed, taking his usual afternoon nap on Tuesday, when he was awoken by an incessant beeping and the smell of smoke. He quickly realized that flames were climbing the walls around him. He leapt from his bed and grabbed a container from the kitchen, filled it with water and flung it at the fire, but it was too late. Flames climbed the curtains, and soon the ceiling was engulfed. 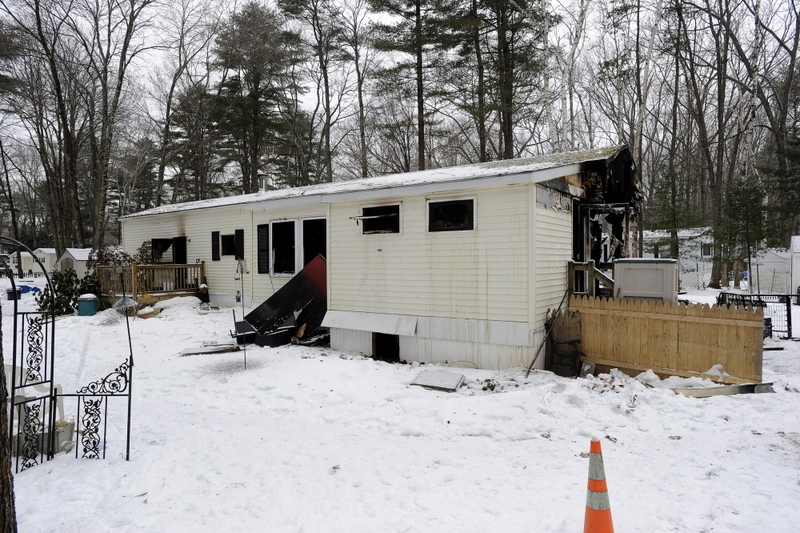 Freeport Fire Chief Darrel Fournier said the blaze was likely caused by the electrical components of the hospital bed, which probably were damaged during a brown-out about a week ago. Fournier said the fire probably started when the circuits in the mobile home came back up to full power, triggering a short circuit or some other malfunction in the bed. Fournier said the home and its contents, valued at about $130,000, are a total loss. Diane Peacock, 60, was at work at the G.M. Pollack and Sons jewelry store in Topsham, preparing to close a sale on a $4,000 diamond, when a coworker said she had a phone call. Her husband was on the phone, and it was an emergency. He told her the house had burned down. “I fell to the floor,” Diane Peacock said. Sitting next to her husband at the hospital on Thursday, Diane Peacock said they feel particularly blessed this year, despite losing the trappings of their life. Richard Peacock looks forward to being released from the hospital as early as Friday. Until the Peacocks can sort out a claim with their insurance company, a neighbor has agreed to let them occupy a vacant mobile home across the street from their destroyed home for a couple of months, until they get back on their feet. Others in the community have already donated to buy them heating oil, and Diane Peacock’s other employer, Shaw’s supermarket, has pledged to help with furnishings and home goods. One neighbor, Sandra English, set up a relief fund at the Atlantic Federal Credit Union in Freeport.